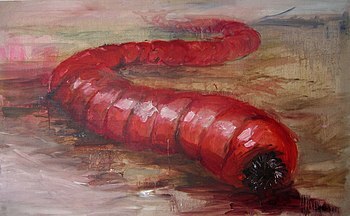 Description: Right here on earth there is the mythical mongolian death worm: Reason for ranking: If it exists it isn’t SciFi, and supposedly it’s not all that big. This potential worm is similar to a combination of Sarlac and the Graboid. It feeds primarily on turtle like arthropods, Reason for ranking: it is more dangerous then the Mongolian death worm, but easily avoidable, and due to the lack of information about this thing we cannot make any solid statements as to it’s capabilities. It’s a large subterranean worm that senses and eats moving objects. 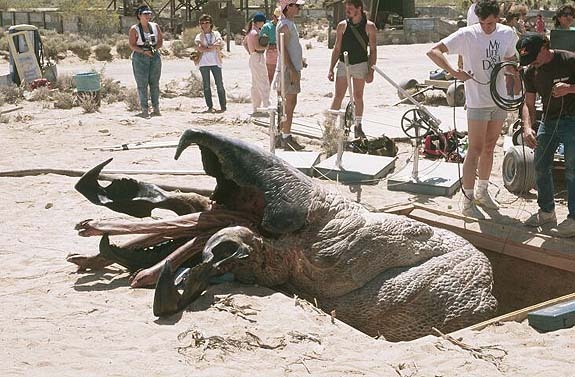 The graboid is carnivorous at it’s core diet-wise, however they tend to “sample” anything that is moving (creating vibrations on sandy ground). They do not use echo location for traveling and have a tendency to run into large subterranean structures and kill themselves. Reason for ranking: They kill a lot of people, but they are not going to be concoring any valleys any time soon. Description: A Parasitic organism that controls the minds ( Puppet Master style), they were an ancient race that managed to rise to power based on their penchant for placing themselves as gods for more primitive cultures to worship. From the Stargate Universe, see more on the Stargate wiki Reason for ranking: They are not very big, and after they tangled with earthlings they lost their stranglehold on the Galaxy. But they were close. Terraform their way to dominion over the earth. David Gerrold, the author of this series has a place in every scifi fan’s hearts as the creator of the Star Trek Tribble! Description: A big purple fuzzy worm. Range in size from as small as a horse, to as large as a bus. Normally bright red, but have been seen in other colors ranging from white to green. They have two “arms” with claws, and are very dexterous. Their bodies are covered with symbiotic “fur”, each strand of which is a distinct lifeform and acts as a sensory input. Though capable of remarkable acts of problem solving and interaction, some worms have been observed to understand a rudimentary English, both their intelligence and their communication abilities have yet to be fully understood. As long as they eat meat, they can continue to grow, but their growth slows when their diet is only on vegetation, but their appetite is much larger. It is understood that a worm “family” consists of four, though their roles are unclear. When a group of worms form a family, they build a large, domed structure referred to as a hut. The worms live in a series of tunnels within and beneath the huts. When many huts are built close together, they start to merge into larger huts, and so on. This process repeats recursively, forming Chtorran cities which the military calls mandalas due to their spiraling shapes. When a worm reaches a mass that makes it unable to move, it will crawl into a dead end corner and eventually die. (reference) Reason for ranking: They are a great species, capable of communication and invasion however the story here has not been completed , so they may yet win!! Reason for ranking: really only a threat to space travelers who are foolhardy enough to hide in an asteroid field. Sarlacci are very dangerous and inhabit remote, inhospitable locations in the galaxy; few scientists have attempted to observe them. Those who do study the sarlacc argue over its taxonomic classification. While most strongly agree that the sarlacc is an arthropod, others point to its anchored root system and spore-based method of reproduction as evidence of a plant origin. A sarlacc reproduces by releasing spores that travel through outer space and eventually come to rest on a planet or asteroid‘s surface, forming a pit which is used for capturing prey. Sarlacc is an “omnivorous, multi-tentacled creature with needle-sharp teeth and a large beak”. The sarlacc rests at the base of a giant pit where the entirety of its body is buried except for the gaping mouth. The creature’s beak blindly gropes along the sloped walls of the pit when the sand is disturbed, searching for prey. The sarlacc’s mouth can reach three meters (10 feet) in diameter; it is positioned on its giant, worm-like head. Astrophysicist and science fiction author Jeanne Cavelos compares the sarlacc to the antlion, an insect that burrows a pit in the sand during its larval stage. Both creatures catch and consume prey that falls into the pit. Because most sarlacci inhabit isolated environments and rely on prey to stumble into their pit, they rarely feed. As a result, sarlacci have evolved an efficient digestive process. The stomach of a sarlacc slowly dissolves prey into nutrients in a painful process that can last for several thousands of years. Victims are kept alive in the acid-filled stomach throughout digestion and few ever escape. This is one aspect of the sarlacc that makes it such a feared creature. As the droid C-3PO announces (translating for Jabba the Hutt) in Return of the Jedi, “In his belly, you will find a new definition of pain and suffering as you are slowly digested over a thousand years”. If no living prey is available, a sarlacc relies on its root system to absorb nutrients. One sarlacc located on an airless moon feeds on cometary material rich in oxygen, hydrogen, carbon, and nitrogen that drifts into its mouth. The sarlacc’s stomach is lined with a fibrous network of vessels that attach themselves to a swallowed victim and Darkmaws for quick digestion or breaking apart large prey, though the maws will close when exposed to bright lights, hence their name. According to the Star Wars Databank, the prey is incorporated into the sarlacc’s biological system as it is digested. Besides digestive acids, the stomach also contains mind-altering neurotoxins which keep victims from struggling and escaping. The toxins induce hallucinations in prey which “suggest that the sarlacc somehow absorbs the intelligence of all its victims, who live on in disembodied torment”. A sarlacc can communicate with its victims through this stolen consciousness. In one Star Wars short story, an old, unnamed Jedi woman who falls into the sarlacc on Tatooine explains that “sarlacci do interesting things with messenger RNA: over the course of millennia, they can attain a sort of group consciousness, built out of the remains of people they’ve digested. I talked to such a sarlacc, once a few decades ago”. She too becomes part of the sarlacc’s consciousness. 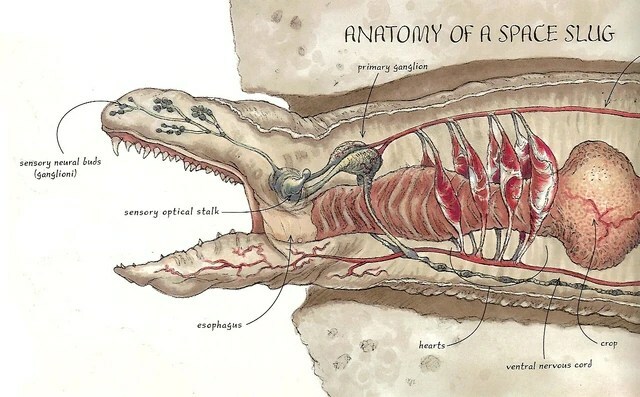 The inside of a sarlacc’s body. Reason for ranking: there are only a few in the universe.. and they don’t move very fast. Sandworms are animals similar in appearance to colossal terrestrial annelids and in other ways to the lamprey. They are cylindrical creatures with no significant appendages, equipped with a fearsome array of crystalline teeth, used primarily for rasping rocks and sand, and more than capable of eating anything imaginable. 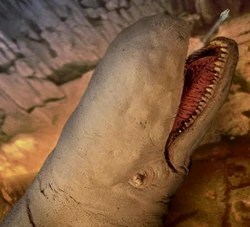 During his first close encounter with a sandworm in Dune, Paul Atreides notes, “Its mouth was some eighty meters in diameter … crystal teeth with the curved shape of crysknives glinting around the rim … the bellows breath of cinnamon, subtle aldehydes … acids …” Sandworms grow to hundreds of meters in length, with specimens observed over 400 meters (1,312 ft) long and 40 meters (131 ft) in diameter, although Paul becomes a sandrider by summoning a worm that “appeared to be” around half a league (2,778 meters) or more in length”. These gigantic worms burrow deep in the ground and travel swiftly; “most of the sand on Arrakis is credited to sandworm action. Sandworms are described as “incredibly tough” by Liet-Kynes, who further notes that “high voltage electrical shock applied separately to each ring segment” is the only known way to kill and preserve them; atomics are the only explosive powerful enough to kill an entire worm, with conventional explosives being unfeasible as “each ring segment has a life of its own.”Water is poisonous to the worms, but is in too short supply on Arrakis to be of use against any but the smallest of them. (reference) Reason for ranking: Sandworms are big, and once you get in their vicinity they will come looking for you. Budongs are the largest space-dwelling creatures in existence; a full-grown Leviathan is smaller than one of a budong’s fangs. These creatures eat rock and ice, but also have an extreme sensitivity to electromagnetism; ships are like “electromagnetic candy” to a Budong, making these creatures the “sea monsters” of outer space. No known substance can survive Budong ingestion; their innards are extremely acidic, and their eight stomachs are infernos that burn at “nine thousand klances” to help offset the chill of space. It has been stated that anything that a Budong eats is ultimately reduced to “liquid ore”. Live specimens of the species are extremely rare — however, when dead, their bones can be mined as nogelti crystals, which are quite valuable. Mining camps similar to those of the Yukon Gold Rush on Earth often spring up on Budong corpses, and Peacekeepers use some Budong mining operations as internment camps as the remains are nonetheless incredibly dangerous; the remnants of the creatures’ digestives system are a constant hazard that have been known to decimate mining operations. 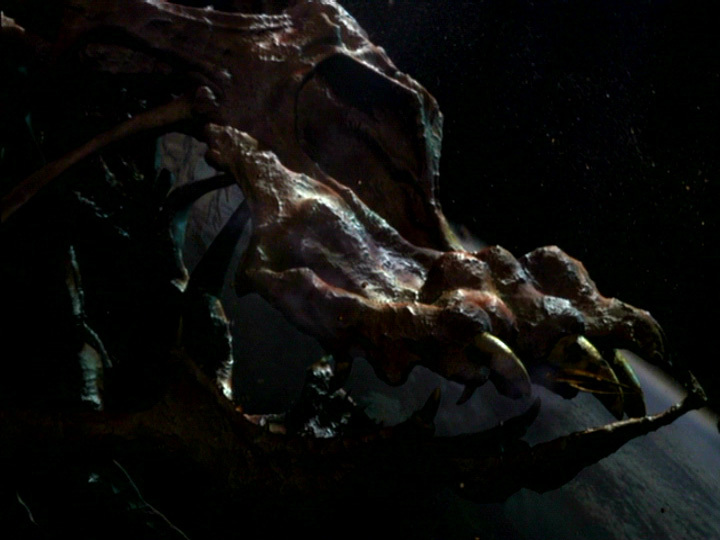 (reference) Reason for ranking: It eats asteroids and has a stomach capable of fusion! takl about indigestion! 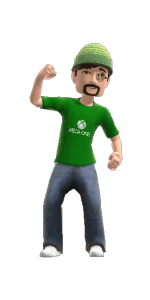 This entry was posted in Leisure, News and politics, Review & Comparison, Top 10 and tagged Aliens, R & R. Bookmark the permalink.